GREY waves cross the surface of the pond, as a March gale shakes the bare trees of Herefordshire. If a poplar can bend in such a storm, how can a peacock quill float hold its own, there in the margins, where a froth of dead brambles hangs above a baited trench? It is a fine spot, for the water gradually deepens from two and half feet to five or so, and the hollow has yielded me some decent fish on occasions. It is madness to float fish, surely? But the swan-shot is managing pretty well, anchoring the quill in relentless lapping ripples; and I have even caught one carp, a small but beautifully formed mirror of two pounds or so. It is modest compensation for being out on such a day. But the capture gives me hope of better things, as the stark black poplars rattle with every blast. They are rooted at the very edge of Clay Farm Pond, immediately to my right, and I fear for my safety. After all, trees can come down in such boisterous weather. The netting of the small mirror makes me reflect on my purpose. What am I hoping to catch, to achieve? A week before, while float-fishing corn in pleasant sunshine, my quill slipped away slowly and I found myself attached to a huge carp, a fish I never glimpsed. Neither my old cane rod nor my angling skills had been up to the task at hand. Never before had I witnessed a rod “going straight” and I panicked and applied too much side-strain too quickly, causing the hook to pull out. Now I am back with a steelier rod, of carbon, and serious intentions. Every gust seems to bring in fresh considerations. What, in fact, is a large carp to me? Not so many doubles have been chalked up to my credit and, on a day like this, a ten pounder would be most welcome; more than welcome in fact. Yes, in the Fifties a ten pounder would qualify an angler for the Carp Catchers’ Club. How times had changed! Half a century ago, no carp fisher would be out at this time of year, in such challenging weather. They missed a great deal, those early pioneers, who only dreamed of summer and golden autumns. For isn’t there a certain purity in winter fishing, when the skies are vast and troubled and browns and greys are the dominant tones? And one sees the trees for what they always have been, beneath the leaves and bluster. Perhaps a fox will slink through the sleeping orchard on that far slope. Perhaps a flurry of rooks will blow in from the restless wood before me; a cawing, swirling, dramatic performance. Was that a bite? The quill seemed to dip, just then. Has something taken a fancy to the soft pellets? It’s hard to tell in these conditions. Perhaps the wind is buffeting the float, driving it down. But no! – there is no mistake, the quill has gone! I do not strike immediately. I seem to stare after the miracle for an age. It seems so incredible, so unlikely. But I must have struck. The rod has taken on a battle-curve. It’s a fine rod, with plenty of play at the top and reserve strength further down. I know I can rely on it, although the pressure is astonishing as the clutch screams and screams, louder than the energetic gale that surrounds me. 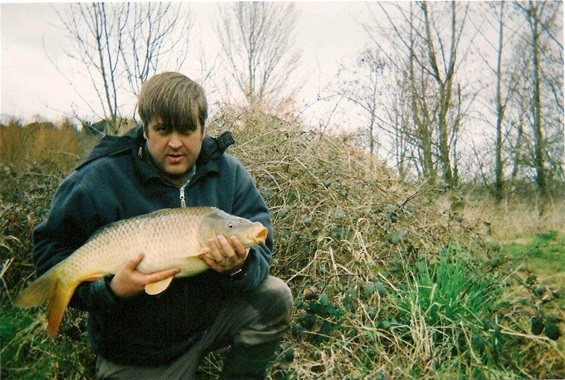 Haven’t great carp been captured on windy days? I think of old Albert Buckley at Mapperley, and how his impressive fish, including a record breaker, were landed in the teeth of stormy weather. My carp is no record-breaker, that is for certain; although I’ve yet to see it. In fact, the float hasn’t broken surface yet, because the fish insists on fighting deep. I recall Severn barbel, and one day in particular when the river was in spate and I hooked fish after fish by a sunken tree. I could not yield one inch of line as the barbel hammered away, towards the welcoming branches, which were so far down in noisy, bubbling force. I can afford to give a little line here, although there are some snags on the bottom of the pool. I’m back-winding now, having tightened the clutch. I feel more in control as the white fluorocarbon line judders into the surface like an automatic needle over ruffled, dirty canvas, – up and down, up and down. Will this fish never give up? There’s an ancient sunken post, out there by the island, and the carp is aware of it: changing its mode from barbel to furious pike in an instant. Where did it locate this turn of speed, this sudden explosive energy? My fingers can barely hang on to the revolving reel handle. I have to stop this fish, but how! The side-strain starts to tell, thank goodness. The line is writing tattoos through the choppy surface, as the fish circles and twists, mere inches from the post. I’m pumping it back now, aware that my arms are getting heavy. Is the fish tired? It must be, as it turns ever decreasing orbits above the dark grey depths before me. The red tip of the float breaks the surface, and suddenly the head of the fish clears the waves, a pair of white lips, as round as a golf-ball. The battle has lasted twenty minutes or more, but now it’s over. As one entranced, like someone in a haunting dream, I push the net out and draw my prize over the floating mesh. It is a common carp, impressive for its length and dark golden flanks. In other pools, a carp of such a length might go far more than 12lbs in weight. But my fish is built for speed and has what “BB” once called “a rakish appearance”. I think of the wildies of Cheshunt, the great English commons that bent the Spanish reed rods of Sheringham and Andrews, almost a full century ago. My fish is not a wildie, although there is something ancient about its lines. I know that Clay Farm Pond, a former syndicate water, was stocked with carp from various estate lakes in the Seventies and early Eighties. It is impossible to guess where and how those fetching lines arose. The pond’s carp keep the secret of their origins. I want a photograph, but I’ve left my tripod at home. The carp has been unhooked on the mat but it is still in the net, and so I place the big net in the lapping shallows and seek assistance from my two fellow anglers on the far bank. They scowl when they hear I have landed two carp, and they scowl in unison when I inform them that one is a double. They even refuse my offer of soft pellets. But one of them agrees to take a quick picture of me with the fish, and for that I will always be grateful. I can ask nothing more of the pool, and so I tackle down. I’ve been chilled to the bone by the rude March winds, but I am content and ready for the long walk back. After all, I have the vision of a gale force common to keep me company all the way home, to a celebratory glass of port by the fireside. Gary well done mate , you do very well on the float you have my respect kindest regards . Woolly Bear .